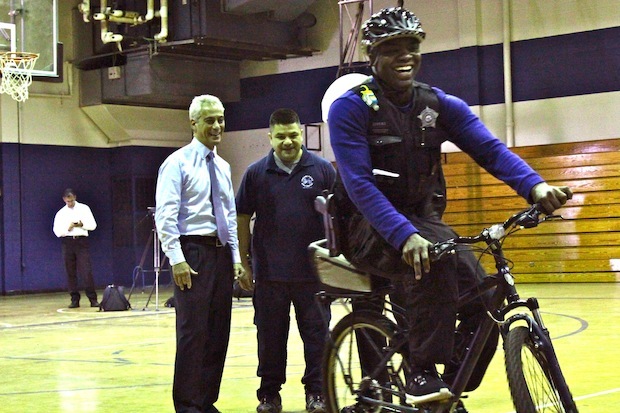 OLD TOWN — Mayor Rahm Emanuel is hailing officers on bikes as the future of community policing. The mayor on Tuesday joined Chicago Police Supt. Garry McCarthy at a training center inside the former Near North Career Metro High School, 1450 N. Larrabee St., for a look at how the city's mobile officers learn to handle their mountain bikes. The training is four days long, and the difficulty increases each day. Emanuel spoke with officers at each of the three training stations Tuesday morning, but didn't attempt the course himself. The training also includes instruction on basic bike maintenance. “If you are not handling the cones properly, we will help you," said Juan Salazar, the main instructor for the Police Department's bike unit. "We always tell them: 'crawl, walk and run.'" Emanuel called the plan "the next iteration of community policing." "We are going to have a more intense relationship and level of trust with community members and residents throughout the city of Chicago and engage officers directly," Emanuel said. "Too frequently, we hear sometimes of officers just driving by, they don’t stop. On bikes, they more frequently stop." The tour of the facility followed Emanuel's announcement of his plan to increase the number of officers on bikes from 200 to 400. Emanuel said he would be setting aside $2 million in next year's budget to double the number of officers trained on bikes while standardizing the Police Department's bicycles. The current fleet is a mix of Cannondales, Treks and a number of other manufacturers. Officers can bid for the bike cop positions, can be identified by their commanders to be trained, or are probationary police officers who have completed their training and are assigned to "Operation Impact," in the city's most troubled areas. There is no additional pay for patrolling on a bicycle, according to police spokesman Martin Maloney. McCarthy and Emanuel both pointed to the extensive use of officers on bikes during the NATO Summit as an example of the benefit of a more mobile unit. McCarthy said one of the most successful tactics used during the summit was using bicycles as movable barriers. At the former Near North Career Metro High School gym, trainees go through a series of stations designed to simulate different scenarios while learning to become comfortable on bikes in tight situations. The class includes teaching officers tactics such as how to dismount in case they have to engage in a gun battle and which formation would be best used in a protest. “All of this course is basically to simulate a crowd," said Salazar. "When you are working large-scale events, you’ve got to be able to maneuver around. If you don’t know how to control your bike, you're in trouble."